By now, most Bulls fans are all too familiar with the term plantar fasciitis, a condition that plagued Joakim Noah the second half of the season and has persisted on during the first two games of the playoffs. But unless you’ve experienced it, you likely cannot truly appreciate Noah’s Game 2 performance in which he endured immense pain on the way to 11 points and 10 rebounds — including nine points (3-3 FG), six boards and one block in the final 7:39 — during 25 minutes of work. So you’ll just have to take Noah’s word for it. Still, when the Bulls and Nets first round series shifts to Chicago for Game 3 on Thursday night, there is no doubt Noah will be in the lineup once again. “It’s the biggest game of the season,” said Noah, who finished fourth in NBA Defensive Player of the Year voting announced Wednesday. “Let’s get it done. What happened in the past, happened. Let’s go. Let’s get it done. 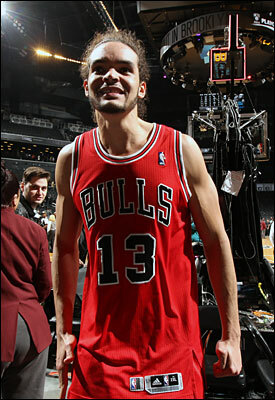 Bulls coach Tom Thibodeau said there were no setbacks for Noah as he went through most of Wednesday’s practice. In Game 2, a limitation of 20-25 minutes was placed on Noah, and Thibodeau didn’t rule out a slight increase. “We’ll see after shootaround, but it will be roughly the same ballpark,” said Thibodeau. In the meantime, Noah will continue to fight through the pain with his trademark passion, energy and enthusiasm as if he has no other choice. It’s in large part because of Noah the Bulls return to the United Center with home court advantage. Noah said the Bulls weren’t able to employ their style of play in the series opener, but he liked the team’s intensity and mindset in Game 2. He acknowledged that complacency could be the Bulls’ worst enemy with an opportunity to take a 2-1 series lead. It is often said that success in the playoffs is dependent on making necessary adjustments as a best of seven games series is played. But Thibodeau discounted the impact of those to a degree. As for what he expects from Brooklyn as they look to counter, Noah wasn’t sure. “But they’re going to give it their best shot and we have to be ready for that,” said Noah. “I just worry about what we can do and what we can control. And be as ready as possible.